The Yelp page of the Red Hen restaurant has become a political battleground after President Trump’s press secretary was kicked out of the eatery. Sarah Sanders was asked to leave as a protest against the Trump administration. The event has caused both supporters and detractors of the president to flock to the page to post images and politically charged comments. Yelp is now actively monitoring the listing and helping to clean it up. In a message put on the page, it said many people had come to comment motivated “more by the news coverage itself than the reviewer’s personal consumer experience with the business”. Ms Sanders was asked to leave the “farm-to-table” restaurant on 22 June after staff protested about her presence to the Red Hen’s owner. The restaurant’s action is believed to be linked to the US government’s controversial policy of separating migrant children from their parents at the Mexican border. President Trump has also commented, saying it should not have asked a “fine person” like Ms Sanders to leave. 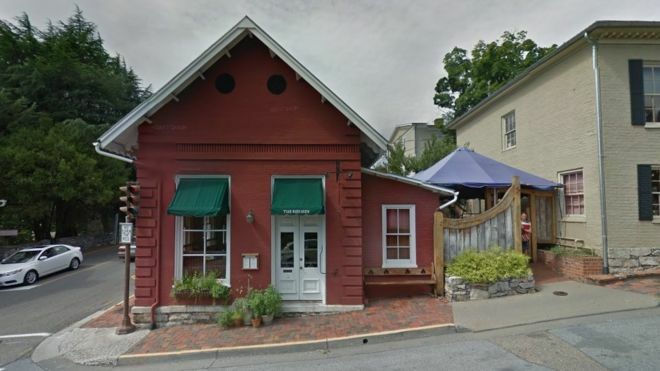 Before events on 22 June, about 5,000 people had left reviews of the Red Hen, in Lexington, Virginia, and most had been positive. Since Friday, the number of logged reviews has tripled. And the large number of negative reviews has caused its star rating to tumble. Reviews now seem to be polarised, with one and five star ratings the most common. One negative reviewer said it was “perfect for serving hatred and bitter spirits to its liberal customers”. A more positive one lauded the Red Hen for the respect shown to its staff “even if it means doing something uncomfortable for controversial reasons”. Swastikas, images of Ms Sanders, cross-postings of social media comment on the incident, accusations of racism and pictures of inedible food have also been posted. Some of those commenting said they had suffered a backlash on other social media pages for leaving a good or bad review of the Red Hen. The furore has also meant another restaurant with the same name, in Washington DC, has incurred the wrath of net protestors. One review on that listing called on the “torch-bearing internet mob” to find the right page for their comments.